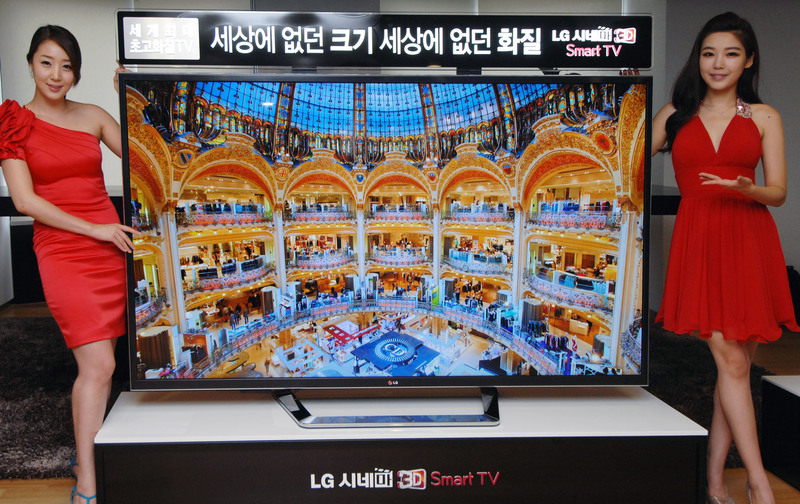 Today LG has officially announced what they call the world’s first 84-inch Ultra Definition (UD) 3D TV for the Korean market with the TV expected to start appearing in North America, Europe, Asia, and Latin America starting in September. What is interesting here is the fact that you get 4K resolution in 2D mode and more than Full HD in stereo 3D mode since the 3D TV set uses LG’s passive (FPR) 3D technology that essentially halves the vertical resolution in 3D mode. And the good news is that the 4K resolution (3840×2160) is actually fully supported by the HDMI 1.4 interface and thanks to the use of passive 3D technology you can also use the interface in 3D mode as well, though you’ll have to feed the TV set with Row Interleaved video data directly as HDMI 1.4 does not currently feature frame packaging support for more than 1080p resolution. The 84-inch LG 84LM9600 Cinema 3D TV is definitely an interesting approach from LG as the company is clearly targeting to get a good market position among the 4K resolution TV sets even though they are still very far from becoming mainstream. And the good thing is that even the currently available technology allows them to support stereo 3D mode, though not in the full 4K resolution, but with more than enough pixels at 3840×1080 per eye for the 3D mode. 4K stereoscopic 3D support with active 3D TV sets at this time would be a problem due to the very high bandwidth requirements in order to push two frames at full 4K resolution, but with all the interest in 4K we are probably soon going to get a new revision of HDMI supporting frame packaged 3D at over Full HD resolution. The good thing from all this is that we are probably also going to have support for 1080p 60Hz frame packaged 3D mode sooner than later, so while 4K TV sets at every home is something still in the not so near future, we may all benefit from that even in the next generation of Full HD 3D-capable solutions. LG Electronics has announced that it is making available the first stereoscopic 3D games for the users of LG Cinema 3D Smart TVs, games that you can directly download and play in stereo 3D mode on your TV set without the need of a console or computer. LG is bringing some popular games that were already made available in 2D for smartphones and tablets such as Air Penguin, which was the top downloaded game app in the U.S. and eighteen other countries last year, Frisbee Forever, Burn The City, Downhill Bowling 2 and Diversion from Unity Technology. These games were apparently handpicked specifically for their stereo 3D playability, their fun factor and they should be offering a nice family-friendly experience in front of the TV set as well. 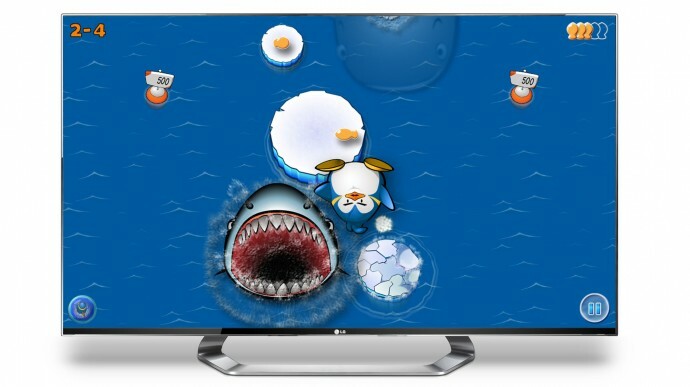 The new selection of stereo 3D games will be available on LG Smart World in the 13 countries where LG Smart TV offers paid services: the UK, Germany, Italy, France, Spain, Russia, USA, Canada, Australia, Taiwan, Singapore, Philippines and Korea. Initially five games should be launched today, July 30 with additional games expected to be available in August. Now, the big question is if this will make a difference for anyone? Certainly not much for gamers that want to play a totally different kind of games in stereoscopic 3D mode on their TV sets, regardless if it is with a console or a PC. On the other hand if you are a casual user and have some time to spend and there is nothing interesting in 3D currently being broadcasted, then you might want to check them out if they are available for free. If LG however decides to charge for these games, then the interest may actually turn to be quite low. DDD has just announced that they’ve got the license agreement with LG Electronics to bundle DDD’s TriDef 3D software with LG’s growing line of 3D PC products renewed for two more years. This extension of the agreement between the two companies will allow LG to bundle the TriDef 3D software for playing games in stereoscopic 3D mode and viewing 3D video clips on their range of notebooks, all-in-one PCs and monitors relying on passive 3D technology. Furthermore the line of 3D-capable PC products from LG will also include a selection of original 3D movie trailers from the growing library of high definition 3D movies available at DDD’s 3D content portal Yabazam. You know, it is not like LG has a lot of choices here, now that the development of the iZ3D Driver has been stopped officially (the unfortunate fate of that software is probably due to the trouble of getting big OEM partners to license it for their 3D products). It is easier to just continue working with a company that offers what you need at a reasonable price and you are happy with the relations you’ve had with it so far. The only other alternative that LG had is to go for Nvidia’s “Optimized for GeForce” program intended for passive 3D solutions, however with TriDef 3D you can use any kind of GPU, unlike with Nvidia’s solution where you need to have an Nvidia-based graphics card. So it is actually not that much of a surprise that LG continues to work with DDD and their TriDef 3D software and there is another major collaboration effort between these two companies that started recently. DDD and LG are already collaborating to introduce 3D gaming to the quite big I-Cafe market in China, estimated at over 144,000 locations. According to DDD the beta testing of the new TriDef enabled I-Cafe software on PC’s equipped with LG 3D-capable monitors began in select I-Cafe locations earlier this month. Currently the list of OEM partners that DDD is licensing their TriDef 3D software is actually quite big and it covers two of the major players – Samsung that is key player in the active 3D segment and LG in the passive 3D segment. Along with them there are also companies like AOC, HP and ViewSonic, though they have less 3D-capable products as compared to LG and Samsung for example.